Well, it’s nearly the end of the year again in Europe, it’s getting colder and Christmas is just around the corner. But before the holiday period can begin there was a date I had been looking forward to all year. 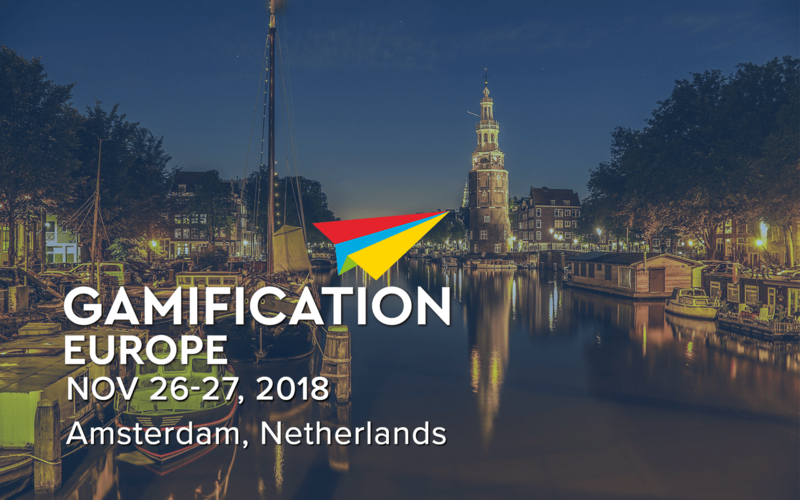 On the 26th and 27th of November, I was fortunate enough to attend the 2018 edition of the Gamification Europe Conference in Amsterdam. It had changed from its 2017 iteration (and birth), and I believe it had improved greatly. It no longer had the two tracks it had from last year, which meant everyone could enjoy everything, but I did feel it missed the interactivity that the workshops offered. You can’t have everything though, despite that small aspect, in my opinion, the quality of speakers and learning was superior to 2017. My praise goes to the organizers of the event: Vasilis Gkogkidis and Pete Jenkins, as well as Michiel van Eunen as the enchanting compère, and Kira Downer and her team for all the behind-the-scenes work that I know goes into these kind of events. It was a jampacked two days, with tonnes of information, and I will relate as much of my thoughts on those topics that spoke to me specifically as possible. But also, for the sake of brevity and professional courtesy, I won’t relate the entirety of every presentation. And for those that have made their slides available, I will add them if I can. Day 1 kicked off with the keynote from Dr. Marigo Raftopoulos on “Has Gamification Failed?”. It was essentially what we all needed early in the morning, a slap in the face and a wake-up call to up our game as gamification industry professionals. And as Marigo said, some may not want to believe it, and others will have to. I, for what it’s worth, fully did believe. In her keynote, she revisited those individuals and companies she had included in her Ph.D. and reported that many had dropped off in the enthusiasm they had originally had for gamification. Main reasons for this were a lack of compelling and sustained services and a dwindling interest, support and satisfaction from leaders and internal adopters. The key lesson(s) from this research then was that we as gamification professionals need to be just that: professionals. There needs to be a higher positive correlation with organizations that take a strategic approach to gamification. And companies are looking for innovative fully encompassed products. They don’t want a vendor that has a selection of fragmented 3rd party services, but rather want a “gamification producer” that essentially delivers the full product. And with that creates a long-term sustainable value for the company. Beyond that Marigo also reminded us of certain core beliefs, as well as giving us hope for the future. She reminded us that we may need to go back to the basics and started off a theme that would continue with every speaker; we’re not delivering games to the client, we’re delivering value for what the client wants and needs. As for the future, it appears to be bright, with many things to look forward to and explore, such as Playful Experiences, AR, Serious Games, and more gamified platforms. Dr. Marigo Raftopoulos slides can be found here. Next up were Dr. Zac-Fitz Walter, former lecturer, now full-time gamifier at EatMorePixels, An Coppens, from GamificationNation, and Melinda Jacobs, from Subatomic. I’ve grouped these speakers together, not to diminish the impact they made, as I found them all three interesting, but rather because their topics fit very well together. Zac was Prototyping, An Playtesting, and Melinda on User experience. Zac, as part of his piece on iterative design, aptly reiterated how important it is to prototype anything you do. And this doesn’t need to be expansive and expensive prototyping, paper prototyping is still the most (cost) effective to test an idea to see if it actually works. But he also mentioned, that with the ease of use that 3D engines like Unreal and Unity provide, you could almost make your prototypes in them as well. With that, I’d like to add that 3D environments like TableTop Simulator on Valve’s Steam platform are also great for those of us who can’t code quite yet and still want a virtual test environment. An Coppens then followed with her piece on playtesting. As with any prototype, it needs to be playtested and revised, and playtested, and revised, and so on… At least with the time and resources, you have available. Since we all have deadlines to meet, one can only playtest so often, so the main takeaway from her was to start early and do it often. And especially to playtest with those that are unfamiliar with the prototype “game” and gain their objective feedback. An Coppens slides can be found here. As the final speaker before lunch, Melinda reminded us all that User Experience, UX, is still all about understanding and learning from real users. We as professionals, designers and creators must always keep that in mind, and that the purpose of what we do is to build stories that give concepts form when reality is too complex, so that users are better able to understand and work with those concepts. Her final quote of choice sums it up nicely: “we are architects that make choices for the user’s story”. After lunch was a discussion with Juliette Denny, Mun Choong Lam, Will Stuart-Jones and Rob Alvarez as host and interviewer. They discussed their work and perspectives as gamified platform providers and offered a fairly positive outlook on the growth and interest still in the gamification industry. They did also echo the theme of focusing on the end user and offering real (business) value to the user and client. Next up was Karen Sikkema, who discussed her work with Living Story, and how it brings digital and physical gamification together through narrative. To illustrate this, she used a case study of the game Lost in Time that they had developed for the city of Utrecht, to bring its history to life. With this, she took us through their methodology, their gamification framework, the Game-based Learning Design Wheel, and the learning they had gained from this endeavour. After Karen came Manuel Pimenta, who continued with case studies of how gamification is working in Portugal, and the success it is having there. Once we had had some coffee and recharged, we heard from Willem-Jan Renger, whose presentation I personally found refreshing, enlightening and humbling. He reminded us that gamification isn’t just for the corporate world, but that it can also have a lasting positive effect in healthcare, both mental and physical healthcare. And also, that not everything needs to be digital, sometimes, very often in fact, physical interaction is a far more effective method of using gamification, specifically playful experiences. Most notably he added this reminder due to the cost scalability when using digital solutions, but I suspect in addition also because of the removal of a human aspect when dealing with the topics he was interested in. The penultimate speaker was Bernardo Letayf, who relayed to us his unconventional journey to gamification and that as with anything, if it’s worth doing it takes time and effort to achieve it. The final speaker of Day 1 was Michiel van Eunen. Who I was glad to hear speak, as I had, unfortunately, missed his session in 2017. He restated the sentiment that even though “things may seem easy, they rarely are.” He took us on a journey of his thoughts and practices when delivering playful experiences and prompted us that we should always keep in mind what the result or outcome it is that we want and that we must always reflect on the process and on what the participants did, to get the most of out it for them. The day ended with drinks, dinner and the award ceremonies. My congratulations to all of those who won and a thank you for the hard work done by the various judges and Dr. Michael Wu for the difficult job of deciding on the winners. Day 2 started with Steve Bocska of PugPharm Productions, who set the tone and theme for the day, looking at use cases and the findings and learnings from them. With his huge experience in producing hit games in the entertainment industry, he essentially proclaimed that the “game” needs to be put back into “gamification”. And with that, it was a focus on ensuring engagement, retention, and interest of the user in the platforms provided to them. To illustrate this, he took us through his Steve’s Net Engagement Score formula, as well as how the user journey evolves through one of their games. He promised a whitepaper, so I recommend you read through that to get a more refined account of their process. After Steve was Juliette Denny from Growth Engineering, who with her immense energy certainly woke us all up. She provided a list of client examples and how traditional gamification mechanics are still good, as long as they have value and fit with what the client requires from them. Next was Andrzej Marczewski, who discussed how we should really be using the limitations imposed on us in the (corporate) real world to drive creativity and great design. And that the realities of the corporate world are that there are fixed materials, limited budgets and scalability issues, which very much echoed Willem-Jan Renger’s points from the day before. Bart Hufen of BrandNewGame led us into lunch with his story of how he became a gamification professional, which I found both interesting and inspirational, as it reaffirmed some of the similar choices that I have made to also pursue a career in becoming a gamification professional. He also took us through his frameworks and processes and how he created a methodology that he could sell and provide value to his clients. After lunch was another discussion panel, with Marigo, Zac, Samantha Clarke and hosted by Vasilis Gkogkidis, where they answered questions on the more academic side of gamification. It was an interesting discussion on the research being done around gamification and certainly added to my Christmas reading list of all the authors they recommended. Immediately after it was Samantha Clarke’s turn on stage. She discussed how she uses puzzles, props, mystery boxes, and role-playing narratives to engage her students. I found it very interesting as it gave me a whole bunch of new ideas to use, as well as discovering that others use RPGs such as D&D when delivering their experiences. Pau Yanez Vilanova from PlayVisit next took us through the creation of their online authoring tool to create geolocation-based adventures. The technology was very interesting, and I recommend that anyone interested in creating their own scavenger hunts or puzzle-based city adventures should check it out. After the coffee break was Will-Stuart Jones from 3Radical, who led us through a case study of a client of theirs, and the uses of having well-designed, reusable base mechanics when building gamification platforms. The day ended with Mun Choong Lam and Michael Wu. Mun Choong Lam, who is an understated storyteller in my opinion, gave a great piece on how he increased his employee engagement and loyalty within his own company, without losing focus on performance and business delivery. It was such an endearing and compelling story that I’m sure that many felt that that was a company that they would also like to work for. Dr. Michael Wu’s closing piece was on the emergence of AI and the effects it is having now and will have on our world in the future. Specifically, the ubiquitous nature that AI and IoT will have and how it will influence our lives through the automation of labor and decision making. I suspect many walked away with a sense of impending doom, and questions around morality, but I felt that it was perhaps a vision that should be viewed from a positive angle. As Michael stated in his closing words, if we wish to avoid the “machine apocalypse” ala Terminator, then we should use the tools we have, like gamification, to be better humans, so that the machines who will learn from us, learn to be better machines too. I for one thoroughly enjoyed the two-day conference. As I mentioned at the start of this piece, it was a great improvement on the 2017 edition, and therefore I expect great things from the 2019 edition. The networking was good, though personally, I wished for a larger space at times. It was good to see old friends and acquaintances from previous Gamification Europe engagements, and I certainly felt welcomed by the community. I did want to speak to more of the speakers and attendants, but unfortunately, there are only so many minutes in a day, and they all seemed very popular with each other the crowd at large. My final thoughts are that the topics were well chosen, they reminded us all that there is still a lot of work to be done, and that a level of refinement and professionalism is still required if we want this industry to thrive and to make the positive difference it professes to aim for. My thanks again to the organizers and the speakers, and I hope to see everyone again for Gamification Europe 2019, where ever it may be.